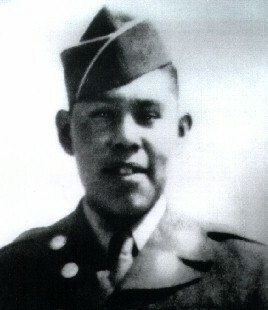 Charles George received the Medal of Honor during the Korean War for heroism on November 30, 1952, in a battle near Songnae-dong. Private First Class George was a member of a unit committed to engage the enemy and capture a prisoner for interrogation. Forging up the rugged slope of the key terrain feature, the unit was subjected to intense mortar and machine gun fire and suffered several casualties. Throughout the advance, PFC George fought valiantly and, upon reaching the crest of the hill, leaped into the trenches and engaged the enemy in hand-to-hand combat. When friendly troops were ordered to return to its initial position upon completion of the assignment, he and two comrades remained to cover the withdrawal. While in the process of leaving the trenches a hostile soldier hurled a grenade into their midst. Private First Class George shouted a warning to one comrade, pushed the other soldier out of danger, and, with full knowledge of the consequences, unhesitatingly threw himself upon the grenade, absorbing the full blast of the explosion. Although seriously wounded in this display of valor, he refrained from any outcry which would divulge the position of his comrades. The two soldiers evacuated him to the forward aid station and shortly thereafter he succumbed to his wounds. Try related studies by using the search engine with: List of Korean War Medal of Honor Winners (Recipients), Famous Native American Inventors, Famous Native Americans and Native American Indians Inventions, Accomplishments, Achievements, History.